Are you the proud owner of goats? 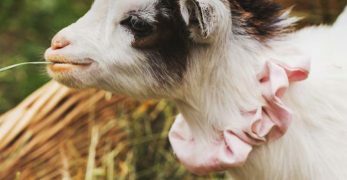 Are you considering becoming a proud owner of goats? 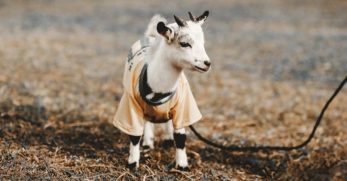 Well, if so, the first thing you need to consider is the type of fencing you are going to use to keep your goat friends in their designated area and out of trouble. 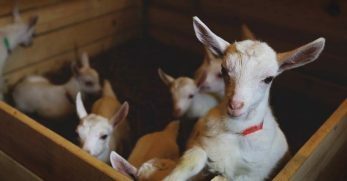 Truthfully, when we were deciding on whether to get goats or not, all of the stuff I read on the internet scared me so badly about them being escape artists that I almost backed out of bringing goats to our homestead. 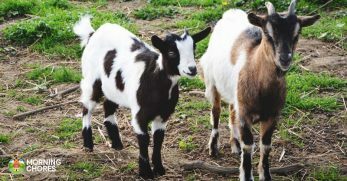 However, after owning a few goats, I love them. I’m so glad they are a part of our homestead. I know they can be escape artists if they set their minds to it, but I’ve also learned a lot about fencing and keeping my goats where they belong. Let’s be honest, if you are like me you want things to function but also look as adorable as possible. Well, fencing is no different. And if you look on Pinterest, you’ll find all kinds of adorable fencing ideas. 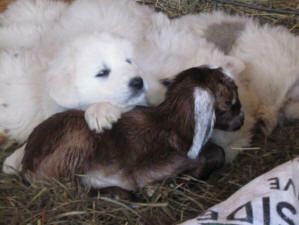 However, I’m going to tell you that when it comes to goats, you kind of have to let go of the cuteness factor. The reason is that if a goat wants to get out, it will most likely find a way out. Therefore, you have to make sure that you choose sturdy fencing that is at least going to put up a fight and make them escaping a little more difficult. So we actually used wooden posts that are placed into the ground and have concrete poured around them. Then we use livestock fencing. We’ve learned that you need to use the smaller mesh. We have the smaller mesh on one of our goat lots, but we did use large mesh for the other goat lot where the larger goats are kept. They have a harder time fitting through the holes, but if they make up their mind that they can fit through it, they sure try. Just remember that the fencing needs to have smaller holes so they can’t fit through quite so easily. Now, I will tell you, I’ve had goats for 4 years now, and they’ve only escaped 3 times during that time period. 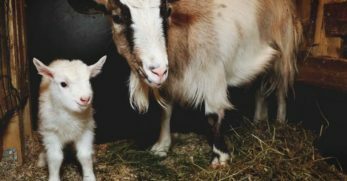 The first time, my female goats were pregnant. There was some type of greenery that was growing right on the outside of their area. Well, they wanted it so badly that they squeezed their pregnant bellies through the tiniest of holes, ate what they wanted, and then came to my back door and cried so I could let them back into their lot. The next time I was in church and got a call from the neighbor that my goats were out. So I rushed home only to find them grazing on the front lawn. Needless to say, I didn’t find that amusing. Then the final time was this past month. My male goat was in rut and acted crazy like they do when they go through this season. He used his horns to ram the goat feeder loose off the side of the fence and then fit through a tiny hole it caused when he broke the hay feeder loose. And he did all of this just so he could run down to the other goat lot where I keep my Mini-Nigerian goats (that he can’t breed with because of the size difference) and wanted to prance all around their goat lot to show off for them. Then when he finished, I opened the gate and he went right back to his area. They are the funniest creatures, but as I said, if they want to get out they can find a way. 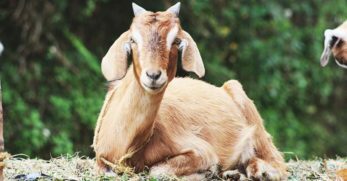 When building your goats’ fence, you should not only consider keeping them in but also keeping predators out. I’m very fortunate that we don’t have many predators in our areas. I’m not sure why, but I sure am thankful. However, if you go up from our house a mile or two, it is coyote central according to what all of our neighbors say. So you must act as though your home has tons of predators because you never know what will drive wildlife to your home. 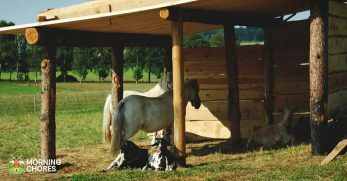 With this in mind, you need to make sure that the fence is sturdy and tall enough that nothing can jump it to get to your goats. 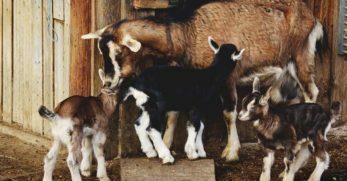 Now, if you live on a larger farm, it is usually recommended to have a Livestock Guardian dog or a donkey out on pasture with your goats in order to protect them. But if not, at least make sure that the fence is around 6 feet tall or so. This should discourage most predators (like coyotes) from attempting to jump it in order to get to your goats. So just keep that in mind as well. 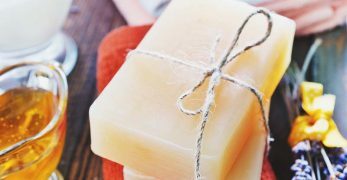 We are actually planning on moving from our current homestead in the near future. With this in mind, I’m having to revisit the goat fencing idea because of different locations we’ve looked at. See, right now, if my goats get out I don’t have to worry all that much because we are so far from the main highway. But some of the locations we’ve viewed are old farm houses that were built closer to the road with the farm behind them. This would obviously be an issue if my goats got out at these locations because of how close we are to a main highway. So I have friends that actually raised goats for a living for a long time. They live on a huge farm with hundreds of acres, but always kept their goats closer to their home which was closer to the road. They recommended we go with electric fencing. Now, the downside to electric fencing is that it does shock the goats until they get used to it and realize that they need to stay away from it. Plus, it is rather expensive. 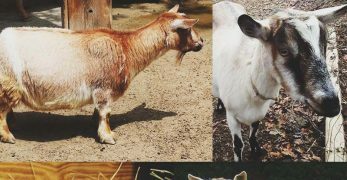 So if you live close to a main highway and worry that your goats will get loose and get hurt (or cause accidents), then you might want to consider investing in the electric fence idea. However, I’m thankful that one of the places that we are considering for purchase is really far off of the road so I may not have to go with the electric fence. I’m thankful because my goats are livestock but have also kind of reached pet status. So naturally it’s hard for me to consider anything shocking them (though it is for their protection.) And I’m also thankful that I may not have to go this route because of the expense as well. 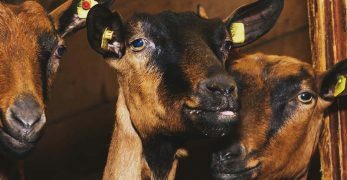 But you may want to think about this option if you have the funds in your budget and you really do worry about your goats getting out into traffic. 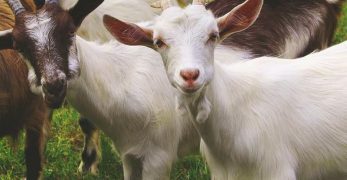 It would be terrible for something to happen to your goats, or worse they cause an accident that results in a human being harmed. Well, our female goats only use the fence to brush themselves. Yet, our male goat loves to use the fence to rack his horns on. So I have to constantly straighten the mesh slots back out because as sturdy as the fencing is, he can still move it around with his horns. 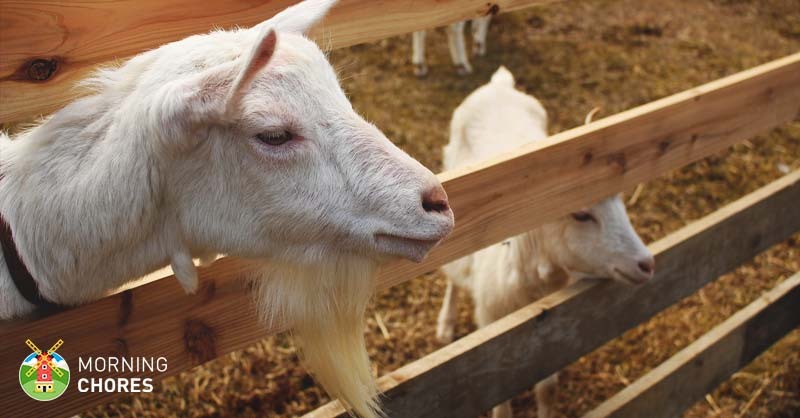 I make our billy goat sound like such a pain (and really he isn’t.) He is actually a super sweet goat, a great stud, and is also wonderful with any goat kids (and our kids.) I couldn’t ask for a better male goat. But he is still a male animal who likes to prove dominance. Which is why he can do a number on our fencing. So if you have male goats, I recommend going with the smaller mesh livestock fencing, or even the livestock panels. They are more expensive, but the likelihood of a goat being able to use his horns to shove the panels around is pretty slim, in my opinion. One thing you are going to have to do if you keep goats, is to make fence maintenance part of your routine. For me, when we feed our goats, I usually do a quick run down of the fence to make sure that Duncan (our male goat) has not created any holes. Because as mentioned, the smallest of holes can be an exit for your goat if they make up their mind that they are going to escape that day. Then every so often, we will have a day where we thoroughly check all fencing, gates, and latches to make sure that nothing needs repair. For instance, this past month when Duncan was in rut he was quite the little pickle to handle. He got to the point where I couldn’t go into the area to feed him (only my husband could) because I guess he knew I was female. So every time I came around, he would attempt to pee on me. He almost got my shoe one day, and I said I wasn’t going in there again until this season had passed. But during this time, our neighbors had decided that they were going to let their goats come down farther than usual, and they were coming down to our goats’ area. Well, this was a problem because all of the female goats love Duncan. So they were trying to get in, and he wanted out to get to them. Then one morning I looked out and all of the neighbor’s goats had made it into my yard and were at the fence trying to get to Duncan from our side. Naturally, I wasn’t getting in the middle of all of that so when the girls went home, I just opened the gate, and he went back in. Then I had to repair the gate so I made that day an unexpected full blown repair day. So just know that depending upon your goats, you may have a little more destruction or a little less. 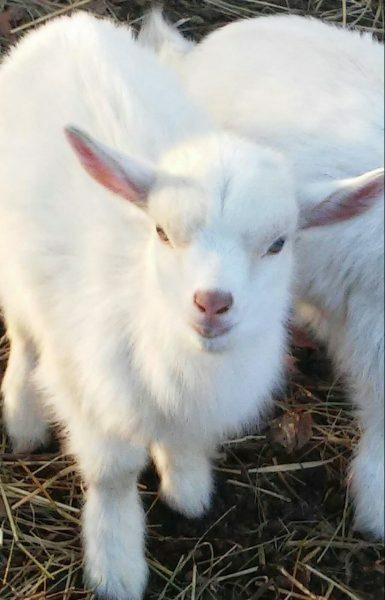 Male goats are naturally a little more of a handful, but I wouldn’t trade mine. He is just quite the ladies man! 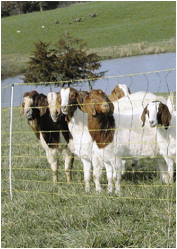 My final tip when choosing fencing for your goats is to simply keep your goats happy. The few times that my goats have gotten out was for a reason that wasn’t that big of an issue. They were happy. So they wanted out to get to a weed they just swore they needed, but once it was done, they were ready to go back in to their home. My goats love their bed, they love their feeding schedule, and they love us because they know that we love them. If you keep them happy, unless they are having a hormonal season, you should find that they don’t want to escape. 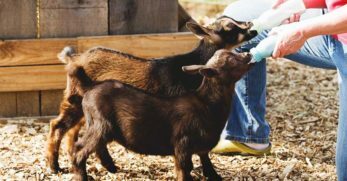 Actually, when we work on our goat areas for cleaning or maintenance, a lot of times the gate will be left open because we are moving things in or out, and our goats won’t even pay it any attention. They are more interested in us or eating. 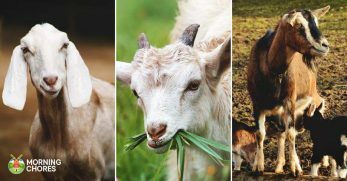 So if you find your goats are trying to escape a lot, you might want to give them some treats and spoil them a little, or check to see if they are going through a hormonal stage such as rut. 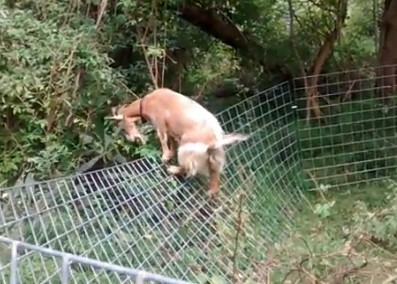 Finding the correct fencing for your goats isn’t all that hard. It is more about finding the fencing that will suit your budget and your location. But I hope you found my few pointers helpful in successfully keeping your goats in their designated area and safe from harm. Now I want to hear your thoughts. 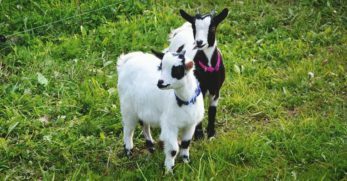 Do you have any pointers on things that should be considered when putting up fencing for your goats?